The T-Mobile Super Bowl 50 Ad could be a star studded Big Game spot. The teaser for the T-Mobile Super Bowl 50 ad drops a lot of names (Justin), but does not reveal any celebrity. The 50 second teaser also features characters from famous Superbowl ads including the girl from the Apple Super Bowl 1984 ad. T-Mobile advertised last year at the Super Bowl with two ads, one starring Kim Kardashian. The "Uncarrier" has not revealed any details about the T-Mobile Super Bowl 50 ad besides that competitors will not like it. It is not all smooth sailing for flamboyant CEO John Legere. The T-Mobile Binge On offer is under criticism by net neutrality advocates. 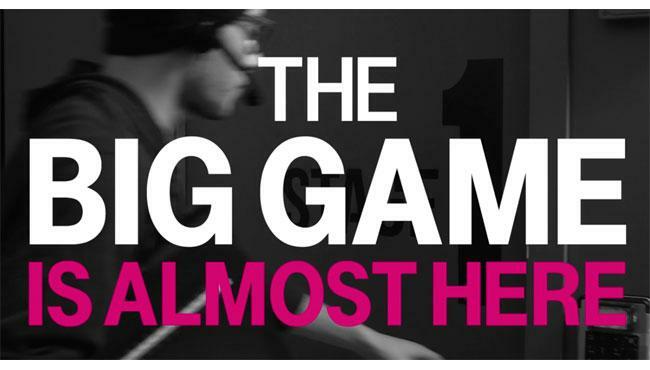 It is likely that T-Mobile is launching a new offer with the Super Bowl spot. Watch below the teaser for the T-Mobile Super Bowl 50 ad. CBS is broadcasting the Super Bowl 50. The Super Bowl 2016 game will be preceded by a weeklong series of public events held throughout the Bay Area. The Super Bowl City fan village, the NFL Experience and the Media Center will be hosted in San Francisco. The Super Bowl 50 will get a week long treatment on CBS involving specials and Late Night take overs. The Super Bowl 50 Kickoff Time is at 6:30pm ET. Read the latest Super Bowl 50 News.